1. General small business liability insurance : every business, even if home based, needs to have liability insurance. The insurance for small business policy provides both defense and damages if you, your employees or your products or services cause or are alleged to have caused bodily injury or property damage to a third party. 2. Property insurance : if you own your building or have business personal property, including office equipment, computers, inventory or tools you should consider purchasing a policy that will protect you if you have a fire, vandalism, theft, smoke damage etc. You may also want to consider business interruption / loss of earning insurance as part of the small business insurance plans policy to protect your earnings if the business is unable to operate. 3. Business owner’s policy (Bop) : a business owner policy packages all required coverage a business owner would need. Often, Bop’s will include business interruption insurance, property insurance, vehicle coverage, liability insurance for small business, and crime insurance. Based on your company’s specific needs, you can alter what is included in a Bop. Typically, a business owner will save money by choosing a Bop because the bundle of services often costs less than the total cost of all the individual coverage’s. 4. Commercial auto insurance : commercial auto insurance protects a company’s vehicles. You can protect vehicles that carry employees, products or equipment. With commercial auto insurance you can insure your work cars, Suvs, vans and trucks from damage and collisions. If you do not have company vehicles, but employees drive their own cars on company business you should have non owned auto liability to protect the company in case the employee does not have insurance or has inadequate coverage. Many times the non owned can be added to the Bop policy. 5. Worker’s compensation : worker’s compensation provides insurance to employees who are injured on the job. This type of insurance provides wage replacement and medical benefits to those who are injured while working. In exchange for these benefits, the employee gives up his rights to sue his employer for the incident. As a business owner, it is very important to have worker’s compensation insurance for a small business because it protects yourself and your company from legal complications. State laws will vary, but all require you to have workers compensation if you have w2 employees. Penalties for non compliance can be very stiff. 6. Professional liability insurance for small businesses : this type of insurance is also known as errors and omissions insurance. The policy provides defense and damages for failure to or improperly rendering professional services. Your general liability insurance for a small business policy does not provide this protection, so it is important to understand the difference. Professional liability insurance is applicable for any professional firm including lawyers, accountants, consultants, notaries, real estate agents, insurance agents, hair salons and technology providers to name a few. 7. Directors and officers insurance : this type of insurance protects the directors and officers of a company against their actions that affect the profitability or operations of the company. If a director or officer of your company, as a direct result of their actions on the job, finds him or herself in a legal situation, this type of insurance can cover costs or damages lost as a result of a lawsuit. 8. Data breach : if the business stores sensitive or non public information about employees or clients on their computers, servers or in paper files they are responsible for protecting that information. If a breach occurs either electronically or from a paper file a data breach insurance for small businesses policy will provide protection against the loss. 9. Homeowner’s insurance : homeowner’s insurance is one of the most important kinds of insurance you need. This type of insurance can protect against damage to the home and against damage to items inside the home. Additionally, this type of insurance may protect you from accidents that happen at home or may have occurred due to actions of your own. 10. Renter’s insurance : renter’s insurance is a sub set of homeowner’s insurance which applies only to those whose who rent their home. The coverage is protects against damage to the physical property, contents of the property, and personal injury within the home. 11. Life insurance : life insurance protects an individual against death. If you have life insurance, the insurer pays a certain amount of money to a beneficiary upon your death. You pay a premium in exchange for the payment of benefits to the beneficiary. This type of insurance is very important because it allows for peace of mind. Having life insurance allows you to know that your loved ones will not be burdened financially upon your death. 12. Personal automobile insurance : another very important type of insurance is auto insurance. Automobile insurance covers all road vehicles (trucks, cars, motorcycles, etc.). Auto insurance has a dual function, protecting against both physical damage and bodily injury resulting from a crash, and also any liability that might rise from the collision. 13. Personal umbrella insurance : you may want some additional coverage, on top of insurance policies you already have. This is where personal umbrella insurance comes into play. This type of insurance is an extension to an already existing insurance policy and covers beyond the regular policy. This insurance can cover different kinds of claims, including homeowner’s or auto insurance. Generally, it is sold in increments of $1 million and is used only when liability on other policies has been exhausted. 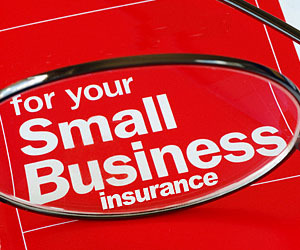 Does my small business need insurance ? Yes. Not having insurance for small business owners, or not having the right kind of coverage, can put your business at risk. Without adequate insurance, a fire, theft, employee accident, or lawsuit could destroy your business and might even consume your personal assets. In fact, your business may be legally required to have certain kinds of insurance. For example, if you have employees, your state may mandate that you carry workers’ compensation coverage,health insurance for small business or you may have to prove you have specific types of coverage in order to get a state or local business license. In addition, people such as landlords or suppliers may require you to have coverage as part of a contract. What can I do if I can’t afford business insurance ? According to the Insurance information institute, about 40 percent of small business owners have no insurance at all because they claim they are cash constrained. The uninsured may be buying into a common misconception, that small business insurance is expensive. The truth is that not having insurance can cost a lot more than annual premiums, you can end up losing your livelihood to a disaster. Packaged insurance solutions, such as business owner’s policies (Bops), give you coverage for basic property and casualty risks at a reasonable small business insurance quotes cost. If the cost of this kind of coverage is still beyond your means, you might want to look into other methods of reducing the expense. For example, a higher deductible will usually lower your premiums. You may find yourself paying higher out of pocket costs should you need to make a claim, but you will be protected when disaster strikes. What kind of deductibles should I carry ? For many business insurance policies, the minimum deductible available is $250 per occurrence. Higher deductibles will reduce the cost of your insurance by lowering your premiums. When evaluating higher deductibles, it is a good idea to carefully consider your circumstances. Ask your insurance provider for small business insurance quote for various deductibles, and analyze them carefully before making a decision. Most liability policies do not have deductibles, although some do for property damage. What can I do to keep my insurance costs under control ? The surest way to control your cheap small business insurance costs is to use what insurance professionals refer to as “risk management”. Using risk management methods, you determine the probability of your business facing a loss, and consider whether or not it needs coverage for that loss. This is a process that large companies use, and one that small businesses can practice to ensure they don’t over or under buy insurance. 1. Identify sources of potential losses. Examples would include casualty and theft losses, fraud and embezzlement, injury claims, small business medical insurance, etc. 2. Evaluate the financial risk posed by each exposure. How frequently might the event occur ? How severe would its impact be ? 3. Determine how to treat the risk. Can it be eliminated or controlled ? Can you transfer the risk to your insurance company ? 4. Monitor the results of your analysis. You may need to review steps 1 to 3 annually. By using risk management to avoid or reduce losses, you can lower the number of insurance claims your business may make. This, in turn, lowers your coverage rates, which are based on your claim history. You may also find that your out of pocket expenses for uninsured claims are lower.